Ay-Ziggy-Zoomba.com • View topic - Former Falcon, Future Felon? Not good news out of New Mexico. Former BGSU AD Paul Krebs has been charged with felonies including fraud and money laundering. The state says he was badly misusing money while the New Mexico athletic director. Re: Former Falcon, Future Felon? Weren't we in the hole financially, after he left BG? I'm thinking we were, just not sure how much. A mil? 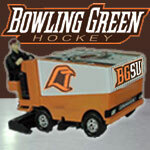 "Regarding BGSU, I would think their biggest strength is that they never give up, They never slow down and they battle hard even after the other team scores. We have to be on our game and never, ever take the foot off the gas for a second." "BG was relentless. It's like they know that a good first pass on the breakout from a defenseman will almost always result in an odd-man rush against them - but they go in anyway and dare you to make that pass. All three of their goals were just grit and effort. That's a team any fan can be proud to support...they give all they've got."